Rangoli Chandel and Kamaal Rashid Khan. Mumbai: Kamaal Rashid Khan aka KRK likes to remind people everyday that he is one of most controversial persons in Bollywood, but only some celebrities give him the opportunity to do so. While his Twitter handle is filled with negative comments about Bolllywood celebrities and their films, no one pays attention to it until some celebrity raises objection to it like when Vikram Bhatt sent him a legal notice or when Ajay Devgn leaked his video clip of his confession about taking money to badmouth or praise films. Few days ago, Shreyas Talpade gave him one of the most hilarious responses when he trashing his debut directorial ‘Poster Boys’, by telling him to stay in his limits and slamming a dialogue from the film on his face. And now Kangana Ranaut’s sister Rangoli also responded to his allegations and made it an ugly spat. 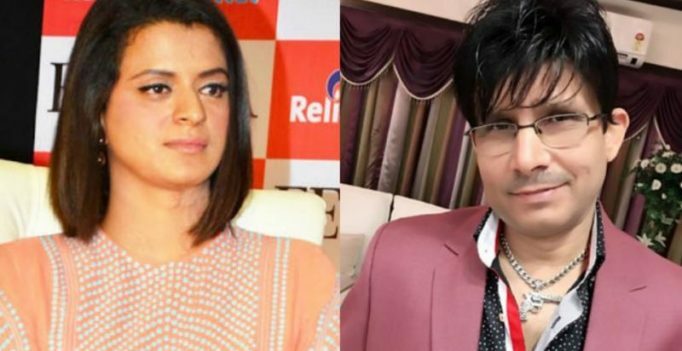 It all started with KRK dismissing Kangana’s claims that she met her ex-boyfriend Aditya Pancholi in 2005, and adding that he has proof from five witnesses that they met in 2003. He goes on to talk about Kangana’s boyfriends, how he was so fed up with the two sister’s lies that he should review it, calls ‘Simran’ a crap film and even rakes up the acid attack on Rangoli and why she shouldn’t have abused Zarina Wahab. Rangoli, who has been going on a rampage slamming reports on websites about her sister and even others like Sona Mohapatra and Zarina Wahab, takes on KRK and it gets too ugly as she calls KRK ‘kutte’, ‘crow’ scumbag’ and much more. Kangana had recently revealed that her sister Rangoli, who is expecting a baby, is very impulsive and hormonal currently and we don’t have any doubts regarding it.